Wisconsin seems like a world away to many in Washington, and not just in terms of mileage. But the ties between union members in the states are strong as they seek to recall Wisconsin Governor Scott Walker. An early voting rally was held outside the SEIU Local 150 offices on Dr. Martin Luther King Drive in Milwaukee, using the iconic imagery of a statue of Dr. King himself as the epicenter. Despite a large union showing and anti-Walker undertones, the event organizers maintained that it was focused on a nonpartisan early voting effort. MILWAUKEE — Washington and Wisconsin have a few things clearly in common. Washington has the UW, and Wisconsin has the other UW. They also share an affinity for a good local microbrew. And when I was cutting it close to making it for an interview, I was delayed by a lifting drawbridge — it almost felt like home. And that’s the way union leaders in the two states want it: tight and connected. Especially now. On June 5 Wisconsin Governor Scott Walker (R) faces Milwaukee mayor Tom Barrett (D) in a rare recall election sparked by Walker’s move to cut collective bargaining for public union employees. Washington unions have joined the battle. Washington state union members have made the trek to Wisconsin to support their allies, said Adam Glickman-Flora, Director of Public Affairs for SEIU, Washington’s Service Employees International Union. The Washington State Labor Council (WSLC), a state federation of the AFL-CIO, has set up two phone banks and are encouraging members to call union members in Wisconsin. WSLC has also conducted a number of events over the last year, including a joint rally with union members from Oregon and British Columbia at Peace Arch Park, and another rally in Olympia in an effort to energize voters against Walker and toward Barrett. Union members with Washington roots are in Wisconsin too. Retired Teamster Tom Herriman moved to Ballard from Brooklyn, New York, in 1991, where he was an active organizer for the Teamsters and a freelance carpenter. Herriman and his wife moved to Washington D.C. two years ago, but they still own their Ballard home and hope to return there once his wife retires. I met Herriman at a protest and march organized by SEIU in Milwaukee. Herriman has been volunteering as part of the recall effort in Wisconsin for two months, and said he felt compelled to lend his support because “this is the most important election of the year.” Herriman said that Wisconsin voters need to recall Walker or Wisconsin will likely become a right-to-work state. Herriman has spent a lot of his time knocking on doors, trying to motivate voters. On any given day he has a list of 50 to 100 addresses and says he doesn’t focus on trying to change minds. Instead, he said, “I concentrate on those that are likely to vote and just need a little push.” Herriman plans to be in Wisconsin through the election. Gov. 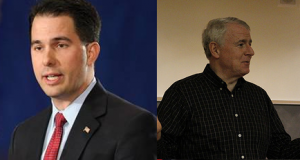 Scott Walker (R-WI) and Tom Barrett (D) go head to head in upcoming recall election on June 5, 2012 (Photo courtesy of http://www.scottwalker.org/ and www.barrettforwisconsin.com/). Unions have been central to this contest since the beginning. Walker beat Barrett in the 2010 gubernatorial election by seven points, and shortly after Walker took office in January 2011 he proposed the Wisconsin budget repair bill on February 11, 2011. Walker said the bill would save Wisconsin hundreds of millions of dollars over two years by requiring state and local government workers to contribute more to their health care plans and pensions. For instance, the bill would increase the average cost of annual health insurance premiums from 6% to over 12%. The bill also sought to remove most collective bargaining rights for unions of public employees. In response to the proposal, protests broke out on the Wisconsin Capitol grounds, and even inside the building. The protests still continue today: each weekday protestors gather on the capitol lawn to do a singalong protest. The debate over collective bargaining is centralized in Wisconsin, but union leaders in Washington see similarities between the two state’s upcoming gubernatorial elections. Jay Inslee, the likely Democratic Party gubernatorial candidate, has voted in Congress in support of collective bargaining, including a 2007 vote for collective bargaining rights for public safety employees. And at the annual Washington Education Association convention on May 18, Inslee said, “As Governor, I will not allow a Wisconsin-style attack on teachers to happen in the state of Washington.” In the six months after Walker’s bill passed, thereby cutting benefits and collective bargaining for teachers, 5,000 teachers retired in Wisconsin — roughly twice the normal attrition via retirement for a comparable time period. From Puget Sound to Lake Michigan, it appears.